"You got a fast car. Is it fast enough so we can fly away?" Live At Billy Bob's Texas (this album) (1999). 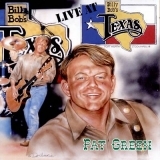 Sorry, no matches on eBay for "Songs About Texas [Live] Pat Green".